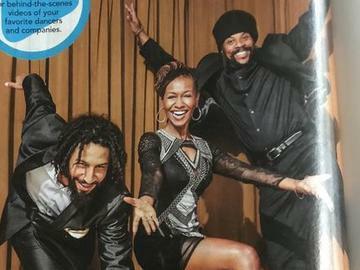 Artistic Directed by world-renowned tap dance luminaries Dormeshia Sumbry-Edwards, Derick K. Grant, and Jason Samuels Smith, the first annual Tap Family Reunion is a three-day celebration of National Tap Dance Day - Bill "Bojangles" Robinson's Birthday. Events include performances, gatherings, workshops and so much more! Taking place at key locations throughout the city, this event is centered on the original American art form of Tap Dance to attract participation from tap dancers and enthusiasts worldwide as well as further engage our local community. All programming is meant to highlight the intergenerational importance of our culture; celebrate our elders and make our history accessible to our youth and everyone in between. Come together and embrace historical connections of the original American art form of Tap Dance that is deeply rooted in New York City! This event is made possible by the Debbie Allen Dance Academy, The New York Public Library's Schomburg Center for Research in Black Culture, So Danca, BLOCH, Capezio, TapTakeOver, Broadway Dance Center, Da Super Villianz (Dormeshia Sumbry-Edwards, Derick K. Grant & Jason Samuels Smith), MYTE (Metropolitan Youth Tap Ensemble), Elka Samuels Smith - Divine Rhythm Productions, Tamia Santana - The Brooklyn Arts, Dance NYC, and Fractured Atlas.